The lyrics in the song about Lancun town go "There's a long story about a train station told by grandpa, and another about a shoe factory sung by grandma". 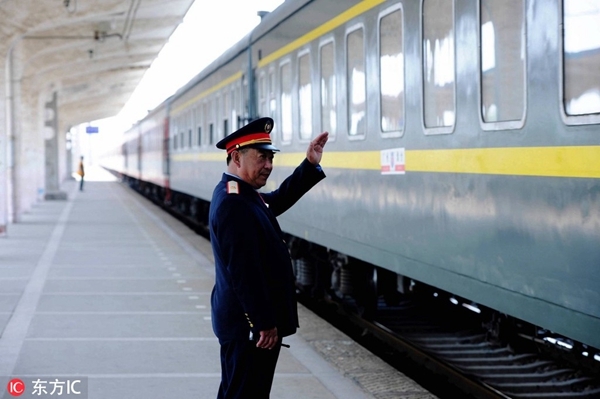 Lancun, a railway hub in Qingdao, Shandong province, may have a written history dating back 1,700 years, but it only began its first steps toward a modern path of growth when a small train station was built there in 1901. Starting in the 1970s, factories began to grow around the station, making Lancun known nationwide for leather shoes, and residents were proud that one-tenth of the leather shoes in China were made there. To date, there are 238 shoe enterprises in the town, involving 40,000 employees. That helped put the town in the role of a vanguard, and it now boasts over 1,000 companies, among which 46 have annual sales surpassing 20 million yuan ($2.9 million). Lancun also specializes in the textile industry. Qingdao Xueda Group President Zhang Shian remembered how a small plant on the edge of bankruptcy had grown into a major company with 15 subsidiaries and more than 4,000 employees. "After the reform and opening-up, Xueda became an original equipment manufacturer for foreign brands, and in the early 1980s we established a research and development center and began fostering our own brands," said the 62-year-old Zhang, adding that since then the profits have grown bigger every year. In 2017, the company achieved sales revenue of 1.58 billion yuan, an increase of 8.9 percent from the previous year. In Cambodia, Xueda has established a production base with more than 1,000 workers making 10 million garments annually. As China turns its focus toward quality growth, Lancun has been upgrading its traditional industry structure to new and high-tech areas. With convenient transportation facilities, Lancun has become home to a cross-border e-commerce industrial park and a railway logistics park, laying a solid foundation for the town to develop high-tech industries. Qingdao Yunlu Advanced Materials Technology has become a leading company producing amorphous strips-an advanced material that can help home appliance makers greatly reduce costs. Amorphous strips produced by the company have 50 percent of the domestic market and 35 percent overseas. "For molten iron at a temperature of 1,500 C, we can bring it down to less than 200 C within a millionth of a second," said Guo Gang, vice-president of Yunlu. "Lancun has offered a prime environment that ensures we focus on business growth instead of operating with environmental risks," Guo said. A new industrial park based around Qingdao Yunlu is under construction. With an estimated area of 9.1 hectares, the park aims to be a leading amorphous strips production base worldwide. Last October, a rail transit industrial park spread across 400 hectares opened in Lancun. Zhou Zunxian, Party chief of Lancun, said the park is expected to be an incubator for companies specialized in rail transit equipment maintenance, key components manufacturing, and research and development. "We will continue to leverage Lancun's geographic advantage and build it as a new urban area led by an international rail transit industrial cluster, with a pleasant living environment," he said.